Snoring, like all sounds, loud or quiet, is caused by vibrations in the respiratory structures. It occurs during sleep when the area at the back of the throat or in the nose relaxes and narrows. The air movement is then restricted in the air passage, resulting in the sound. The most serious type of snoring can stop the breathing; this is called Obstructive Sleep Apnoea (OSA) and can be moderate to severe. In milder cases the airways narrow greatly but do not close. This results in breathing being very shallow loud snoring. The more severe type of OSA is caused by the lack of muscle tone in the upper airway which causes the airway to close fully and one or more pauses in the breathing. The body’s natural reaction causes breathing again, with a gasp. It is a very difficult condition to diagnose and most people who have sleep apnoea don’t know they have it, as it only happens during sleep. Your partner may be the first to notice the signs. 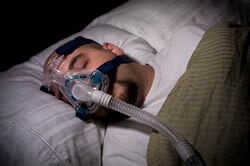 Once sleep Apnoea is suspected a sleep study will be carried out to confirm the diagnosis. There are many products on the market to help with snoring, but your dentist can fabricate a device that is custom made for you. It is called a Mandibular Advancement Device and works by holding your lower jaw and tongue forward therefore keeping your airway open whilst you sleep. Please speak to your dentist for further advice.